Promoting a trade show booth using audio-visual gear can be an effective way to bring attention to your booth. It is an excellent way to showcase a product or service. The use of a large screen television and sound system can help to drive potential customers into your booth. If you are in a large venue there are several devices that can play your video content to as many televisions or projectors as needed. Having the right audio-visual gear for a trade show booth can make your business look professional and impress a potential client. Trade show booths vary in size and setup. Some booths can be small consisting of only a few kiosks. Other booths can have several kiosks and the main presentation stage. Outfitting your booth with the proper audio-visual gear can take some planning. The size and scale of your AV requirements will vary, but the key components for most booths will be the same. An HD television or monitor is a necessity if you plan on playing video content. It can also be useful to plug in a laptop to show a PowerPoint presentation or demo. The size of the monitor will vary depending on the size of your booth. Make sure that this monitor has inputs for HDMI, VGA and RCA video. Many monitors will allow you to mount it right to your booth; in most cases, it will require a mounting bracket. Your booth may also require more than one monitor. A digital media player is a great little device that will plug into an HDMI television and playback just about any video file. It will play files off an SD card or USB storage device. The portable media player comes with a remote for easy playback. You can also set it to loop a video for continuous play. These devices are small and portable, so they can be hidden out of site. A sound system is great to give a presentation or entice people to your booth with music. Wall mounting your speakers is a nice option, this allows the speakers to be up high and out of the way. You may also consider plugging in a wireless mic to make announcements and to give a presentation of your product or service. Proper lighting can help enhance your booth. It can showcase a product or image. Additional lighting to a sign or presenter can make them standout. 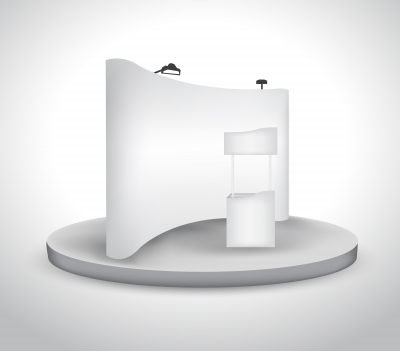 Promoting a trade show booth using audio-visual gear can really enhance your booth. It can help showcase your product or service. Give your company the edge by adding some of the audiovisual gear recommended in this article. The right AV gear can make your booth shine.